Arizona Native Status: Introduced. This naturalized weed is native to Europe. Habitat: Desert, Upland, Mountain, Riparian. This plant is usually found in gardens or in disturbed, weedy locations where it can get a little extra water. Flowering Season: Spring, Summer, Fall. In the desert, this plant blooms in the springtime. 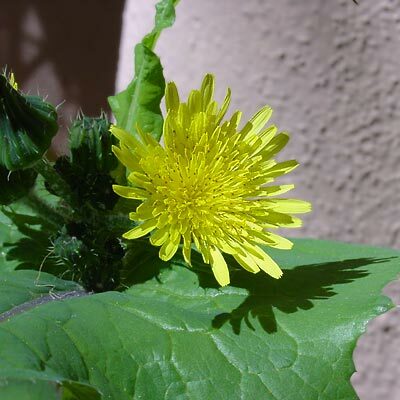 Description: The flower heads are dandelion-like and up to 1 1/4 inches (3.2 cm) wide. The flowers are followed by seed heads with fuzzy, white seeds. The leaves have toothed or minutely prickly margins and are large, powdery green to tinged purplish, and pinnately lobed with a triangular tip. The lower leaves are stalked, while the upper leaves are sessile and clasp the stems. The stems are upright, green to purple, and branched or not. 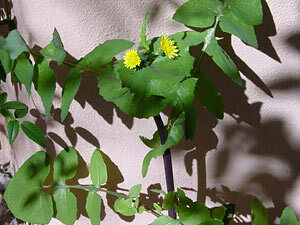 The similar Spiny Sowthistle (Sonchus asper) has large, stout spines on the leaf margins, and Common Dandelion (Taraxacum officinale) is a much shorter, low-growing plant. Edible – The young, early spring leaves are edible either raw or cooked, but any marginal prickles need to be removed.